By booking with SouthAfrica.TO you qualify to earn travel vouchers. Simply email a writeup of your flight to Johannesburg to cheapflights@southafrica.to and we'll send you flight discount vouchers (better quality reviews earn more). All of Airlink, SA Express and more recently Fly 88 operate flights from Nelspruit to Johannesburg, so to get a cheap flight (or more, to avoid a very expensive one) be a bit flexible with dates. Alternatively, it's not too far to drive. What I love about flying from Nelspruit is that the planes park right on your doorstep at Kruger Mpumalanga International Airport. Seats on the plane were spatious, and our pilot (Lyndsay) gave us a smooth BA Nelspruit to Johannesburg flight (29 Apr 2011). 27 Jan 2015 Airlink has increased their flights to Johannesburg from Nelspruit. There will now be 3 return flights a day during the week, one flight on Saturdays and three on Sundays. 19 Feb 2014 Fly 88 announces that it is launching flights from Nelspruit to Lanseria Airport. 1 Nov 2013 SA Express commences flights from Nelspruit to Johannesburg. 10 December 2012 Fly Go-Air flies its first and only flight from Lanseria to the Kruger. 11 February 2012 British Airways flights from Nelspruit to Johannesburg are suspended from. Take the N4 from Nelspruit to Pretoria, and then turn off onto the N1 south towards Johannesburg. 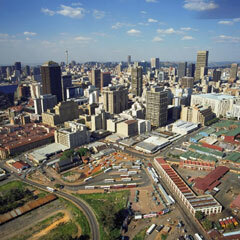 See our list of options for accommodation in Johannesburg.